Add the red wine, cup of sugar and spices to a saucepan and heat through until the sugar is dissolved. Peel the pears (Tip: Leave the stems on, it makes them easier to pick up and pretty to boot). 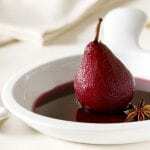 Place pears in red wine and boil over low heat until the pears are soft. Once soft, turn off and leave pears in the red wine so they continue to soak up flavour. You can serve the pears either cold or at room temperature. To make the chocolate sauce: Chop chocolate. Heat cream until just below boiling point. Stir until it’s melted, then add the coffee and syrup and stir well. Serve pears with a generous dollop of ice cream and a jug of chocolate sauce on the side.